For sight-seeing visitors to Choshi, the greatest charm of this port town lies, no doubt, in the natural beauty of its coast lines. Cool in summer and warm in winter, Choshi abounds in a large variety of delicious seafoods fresh from the neighboring waters. Choshi still abundantly preserves a naive atmosphere in itself, which is by no means easy to be found in other holiday resorts today. A 110 year-old milk-white lighthouse stands gracefully at the tip of the cape against a grand spectacular background of the Pacific Ocean and its surging waves breaking over costal crags. 1,450 meter long over the Tone River, this bridge is playing a vital role in communication by connecting Choshi and neighboring Ibaraki Prefecture. 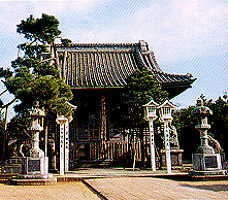 Choshi is a 'temple town'. Shopping districts have developed around this temple. 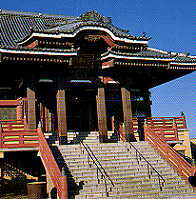 On a hill overlooking the Central Fish Market, stands the shrine dedicated to the fisherman's guardian god, as is referred to in a local folksong 'Tairyo-bushi'. 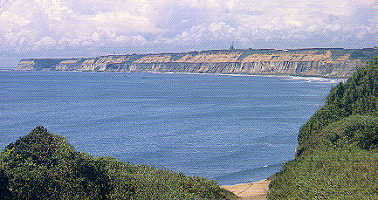 In grandeur, the rugged towering cliffs of Byobu-ga-ura rival the chalk cliffs of Dover, England. 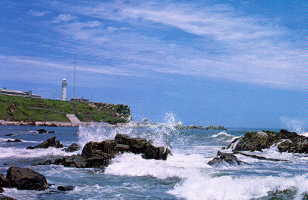 Choshi is surrounded by the sea on three sides. From the top of Mt. 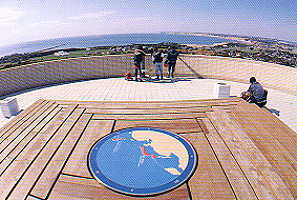 Atago, visitors can enjoy a panoramic view of the great expanses of land and sea, and confirm that the earth is round, indeed. 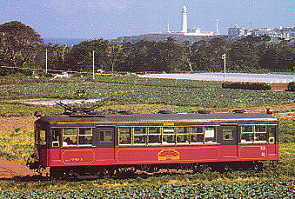 Local line connecting downtown Choshi and Tokawa Fishing Port via Inubosaki. 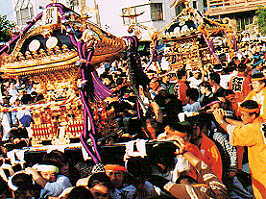 The biggest summer festival in Choshi. These are many monuments for poets and artists. This is one of the most famous monument. 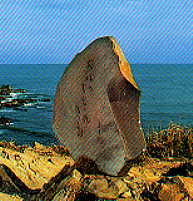 Besides being a base for fishery and fishery related industries, Choshi is famous for its 300-year-old soy-sauce manufacturing industries, of which Yamasa and Higeta are the most representative today. 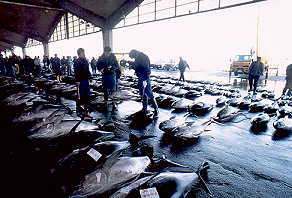 With warm and cold currents meeting near Choshi, a wide variety of marine products are caught in large quantities off the coast, and brought into the Fish Market through the Choshi Fishing Port.